It’s always nice to see a new Rhyming Reels slot; these Microgaming creations take children’s nursery rhymes, drag them into a contemporary setting and add a touch of humour. With that in mind, Georgie Porgie seems like an ideal subject for the Rhyming Reels treatment; we have the slightly awkward Georgie chasing a selection of girls around what looks like a college campus. In the original rhyme, the protagonist went round kissing girls until he was chased off by other boys. So this slot has five reels and a mere fifteen paylines but those reels are placed on the pages of a book as a reference to the original rhyme. The standard playing card icons make up the lower value symbols but the main ones are all updated illustrations in story order; so we have Georgie himself, Georgie kissing a girl, then making a girl cry, the girl’s friends and then those boys chasing Georgie away. The scatter symbol which triggers the free spins is some breath spray while the game’s logo is the wild symbol. There’s some big money available here (up to 975,000 coins) and you can trigger the spins by landing three, four or five of the breath spray symbols anywhere on the reels. That will win you 15, 20 or 25 free spins respectively. Unusually every win will be subject to a 5x multiplier but that’s not all; every spray symbol that lands will award you one more spin and every time you land two, that’s worth 2x your total bet. The bad news is that the spins can’t be re-triggered but of course they can be extended by the continual landing of scatter symbols. 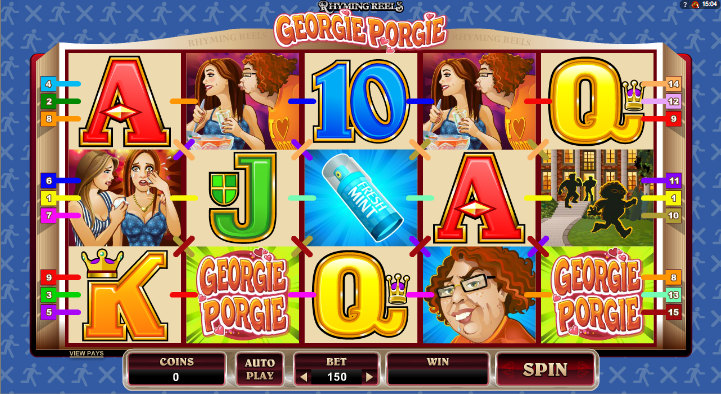 The big money is in the free spins so play with the maximum number of lines to try and trigger it. 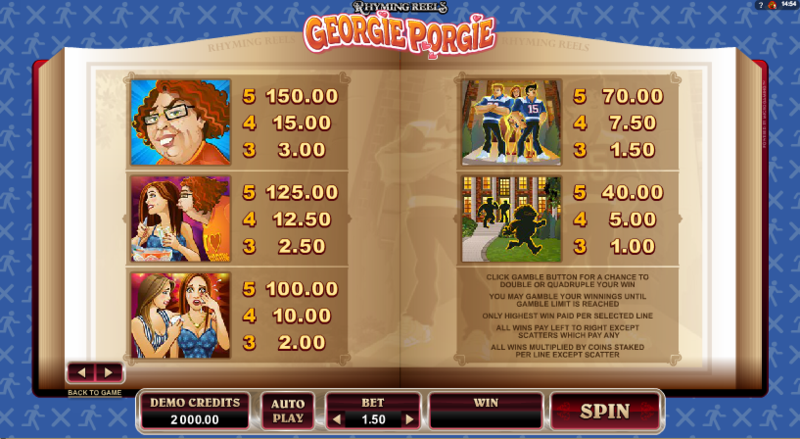 Maintain a reasonable wager level if you can as your bonus wins will depend on your total line bet. Rhyming Reels slots are actually pretty basic but the premise is interesting and they’re good fun; look past the slightly average graphics and try and get your hands on that free spins round for the big buck.